Shackers and Quake fans have a few days to scratch together the money to buy tickets to the BYOC and conference. The wait is finally over. No, we're not talking about Quake Champions never-ending development process, but QuakeCon 2018 tickets will finally go on sale this week. Ticket sales for the BYOC (bring-your-own-computer) will begin at 7:30 PM central time. Quake fans and Shackers can head to the official QuakeCon 2018 event site to buy tickets to the BYOC, esports tourney, panels and the keynote. 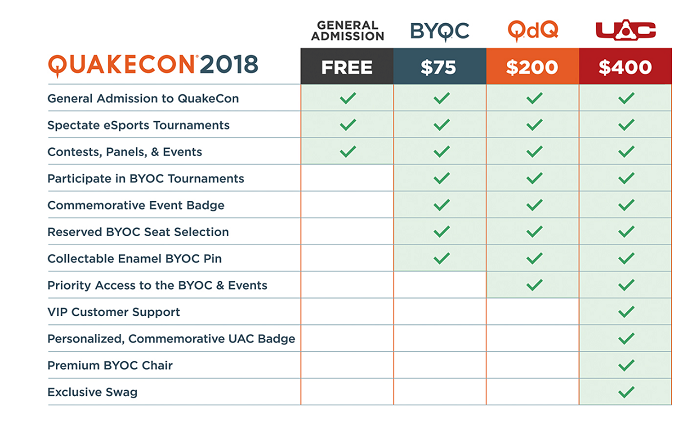 Please take a look at the breakdown of all of the benefits to the four tiers of QuakeCon 2018 tickets. QuakeCon 2018 has added some new things to improve the ticketing experience including support for Group Ticketing. A single ticket purchase can now include up to ten tickets. The system we have this year allows ticket transactions to include seats and swag packs as part of the purchase. These opportunities are presented after seat selection and before payment. QdQ and UAC, as well as Swag Packs are available in limited quantities. You’ll only be able to buy one UAC Seat per transaction. Swag Packs will be limited to three (3) per transaction. Swag bags may only be purchased by residents of the United States (including its territories). ALL purchasers must be present at QuakeCon 2018 at the Gaylord Texan in Dallas, Texas August 9-12, 2018, and must present proof of purchase to receive the swag bag – unclaimed swag bags will not be mailed. Swag bags are not returnable or exchangeable – NO exceptions. This sale is limited to stock on hand; no rain checks are available. Void where prohibited, taxed or otherwise restricted. The product images shown are for illustration purposes only and may not be an exact representation of the product(s). Products and specifications subject to change without notice. Is there a “queue” for tickets? No. When ticket sales begin, the link will take you directly to seat selection. Up to ten (10) tickets can be purchased in a single transaction, either for General Admission and/or a BYOC seat. Then, up to ten (10) QuakeCon done Quick seat upgrade packages can be purchased in a single transaction, up to three (3) Swag Pack merchandise packages, and up to one (1) UAC VIP seat upgrade packages. There are over 4,500 BYOC seats that are available for reservation – more than double what we made available in 2017. Additionally, there are a limited number of remaining UAC VIP seat upgrade packages*, 250 QuakeCon done Quick seat upgrade packages, and 500 Swag Pack merchandise packages available. All tickets, seat upgrades, and the Swag Pack merchandise packages will be available at Friday, June 29th at 7:30 pm Central. Those who purchased a UAC VIP seat upgrade package for QuakeCon 2017 — our UAC Acolytes additionally will be contacted with first right of refusal on a presale opportunity coming next week. I’ve ordered more seat upgrades than seats! What do I do? Whoops! Please contact customer support at support@showclix.com and we’ll make it right. Are all the types of tickets for sale at the same time? With exception to the UAC presale for 2017 UAC guests, this year all tickets, seat packages, and swag pack merchandise packages are being released for sale at the same time. Do I need to purchase a BYOC ticket to purchase a SWAG PACK? No, Swag Packs can be added to General Admission and BYOC tickets. Are you planning on attending this QuakeCon 2018? Let us know in the comments section. Be sure to circle June 29 on your calendar if you want to snag a spot at this year's BYOC. were the dates known ahead of time? im trying to think of an excuse to get out of something else... like "they only just now announced the dates!"